GWANDA- The Minister of Higher and Tertiary Education, Science and Technology Development, Prof Doc Amon Mugwirawho presided at the Joshua Mqabuko Nkomo Polytechnic graduation ceremony where1077 teachers and 181engineers graduated congratulatedand encouraged technical engineers to be self-employed introducing the culture of change in the higher and tertiary education saying products of education should not be only caps and gowns and certificates. “The products of education must not be caps and gowns like I’m putting on today, they shouldbe products and services, whatwe can do, not what we have in terms of paper. The question, “do you have papers?” should not be asked because the paper is obvious. “When we educate people who do not have production, at the end of the day we will lose faith in education and we will start inventing new ways of doing things, I don’t know if ever there is any replacement for genuine education,"he said. He encouraged on creating a Zimbabwe desired by its own people using the robust system of education, fighting poverty since the educated people are the community Giants which should be characterized by levels of thinking not labels. In order to create a Zimbabwe free of poverty and hate, graduands were encouraged to own the country first so that they take responsibility. 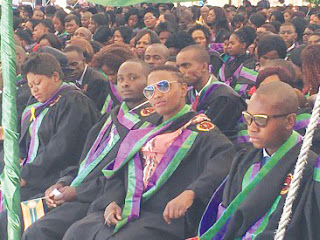 He added that there is skills deficit of more than 50%, mainly in areas of science, engineering and medicine saying that only 38% is skilled in a bid to makegraduands realize that there is a lot of work to be done in order to cub poverty in Zimbabwe. “On average our skills are at 38%, we have a skills deficit of over 50% in the areas of science, engineering and medicine our skills deficit is 95%, this basically means that we have a lot of work to do ,the queation is,'are we ready to do it?" Technical education graduated 181 students out of 209, 79 males and 102 femalesgiving a pass rate of 87% with +2% variance from the 2016’ 85%. Division of Education graduated 1 077 students, intake 45 had 220 out of 223 giving a pass rate of 98, 7%. Intake 10 ECD 189 out of 189 scooping 100% pass rate whereas intake 46 had 426 out of 439 thereby having 97% pass rate. Intake 11 ECD had 242 graduands out of 243 giving it a pass rate of 99, 6%.